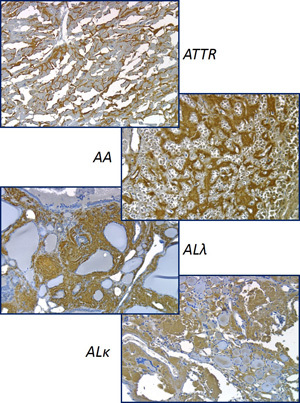 The history of the Amyloidosis and Cancer Theranostics Program (ACTP) is rooted in the study of light chain (AL) amyloidosis and the development of novel agents for the study, detection and treatment of this disease. In recent years, the Program has both extended its horizons to encompass all amyloid-related disorders and some specific malignancies, and focused principally on peptides as biological agents for targeting these diseases as a means of detection and treatment. The major thrust of the ACTP is developing, characterizing and translating novel synthetic peptides into the clinic for the non-invasive imaging of amyloidosis in patients by using PET/CT and SPECT/CT. In addition, we are developing novel strategies for the treatment of amyloidosis by exploiting the exquisite targeting abilities of the synthetic peptides. In collaboration with colleagues at the University of Tennessee and Oak Ridge National Laboratory, we are assessing the ability of synthetic peptides to inhibit cell infection by cytomegalovirus, a major cause of childhood deafness and mental retardation. Finally, work with the University of Tennessee Medical Center and UT College of Veterinary Medicine has led to our discovery that peptides can be used to target metastatic melanoma as well as certain carcinomas. The ACTP has evolved into a multi-disciplinary, collaborative, translational research program focused on the development and evaluation of biological reagents for the detection and treatment of amyloidosis and cancer. Jonathan Wall, PhD, Professor at UT Graduate School of Medicine and the Director of the Amyloidosis and Cancer Theranostics Program, and his research team are developing novel biological therapeutic and diagnostic ("Theranostic") agents for patients with amyloidosis or cancer. Amyloidosis is a fatal protein-folding disorder characterized by the formation of well-structured protein aggregates that deposit in organs and tissues in conjunction with complex, highly charged, heparan sulfate proteoglycans (HSPG) that are produced by the surrounding cells. The unrelenting accumulation of amyloid often leads to organ dysfunction and severe morbidity. Amyloid can affect any organ or tissue but the kidneys, pancreas, liver, spleen, nervous tissue and heart constitute the major sites of deposition in patients with familial or sporadic forms of “peripheral” amyloid disease. Although varying in etiology and site of deposition, the amyloid deposits are remarkably similar. For example, all amyloid lesions contain: unbranching protein fibrils (~ 10 nm in diameter); the serum protein SAP (serum amyloid P component), and HSPG. The deposits may also be found in the brain, as in patients with Alzheimer's, Huntington's or prion diseases, or they can involve visceral organs in patients with peripheral amyloidosis, such as, light chain (AL) amyloidosis, reactive (AA) amyloidosis and the hereditary transthyretin amyloidosis (ATTR). Amyloid may also be associated with natural aging when heart amyloid composed of native transthyretin is observed (wtTTR). The peripheral amyloidosis are orphan disorders but account for more than 5,000 new patients annually in the U.S. alone. Currently in the U.S., there are no reliable methods to document the extent, the progression, or the resolution of peripheral amyloid deposits in patients. To this end, the ACT Program has, over the last decade, developed amyloid-reactive antibodies and peptide agents (“biologicals”) for the treatment and detection of these amyloid deposits. 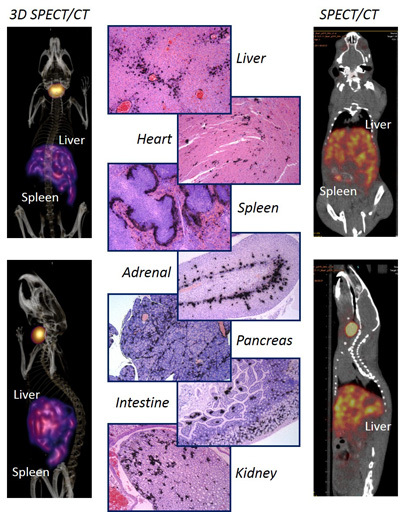 It is anticipated that these novel imaging agents will provide a non-invasive, quantitative, objective method to assist in diagnosis and prognostication. In addition, these techniques can also provide valuable insight into the patient response to anti-amyloid therapies both in the clinic and, possibly one day for those enrolled in clinical trials of novel therapeutic interventions. In patients with Alzheimer's or peripheral amyloidosis, amyloid fibrils and HSP molecules, build up relentlessly in the brain or visceral organs. Doctors do not know whether amyloid causes Alzheimer’s disease or type 2 diabetes, or whether these diseases lead to amyloid formation; however there is no doubt that the accumulation of amyloid is pathologic in the peripheral amyloid disorders - notably AL, ATTR, and AA. Therefore, there is an urgent need to "see" amyloid in order to accurately diagnose and stage the diseases and monitor the therapies used to treat patients. Now, through the research of the ACT Program, it may be possible to do this. The primary candidate for a new amyloid imaging agent is a peptide designated p5+14. In preclinical testing, peptide p5+14 has been shown to bind to amyloid in the brain and many other organs. In addition, when radiolabeled, the peptide was shown to bind to all visceral amyloid deposits in a mouse model of AA amyloidosis by using through PET imaging and other techniques, such as microautoradiography. Wall expects that with appropriate modifications, p5+14 may eventually be used in the clinical setting to provide a safe, non-invasive method for obtaining quantitative and whole body images of the distribution of peripheral amyloid in AL, ATTR, and AA patients. Every day, doctors in the U.S. send their patients with amyloid disease to Great Britain, the Netherlands and Italy for an imaging test not approved for use in the U.S. The European test relies on a protein (SAP) that is isolated from human blood, so the U.S. Food and Drug Administration will not approve its use. The p5+14 peptide, however, is chemically synthesized, so Wall and his team believe the p5+14 peptide imaged by using PET/CT is the combination that will bring this life-changing test to America. In the U.S., our ability to detect amyloid deposits is limited. The peptide p5+14 for which a patent was recently issued, is the next generation of amyloid-imaging agents, and it holds much promise for helping people with amyloid-related diseases. This ongoing research program is supported by the National Institute of Diabetes and Digestive and Kidney Disease (NIDDK) at the National Institutes of Health. 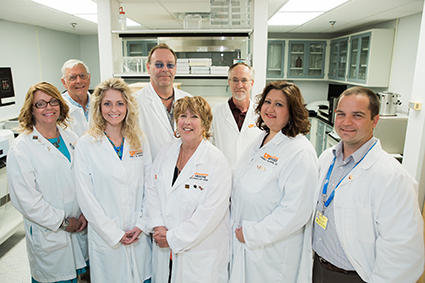 The University of Tennessee Medical Center and UT Graduate School of Medicine have a rich heritage in amyloid research established by Dr. Alan Solomon and the Human Immunology and Cancer Program - the forerunner of the current ACTP. While peptide p5+14 does not destroy amyloid, it does bind to every type of amyloid that has been evaluated in the laboratory. It brings us one giant leap closer to understanding and developing rapid methods for accurate diagnosis and treatment strategies, leading ultimately to a cure for amyloid - related diseases. Melanoma is the major cause of skin cancer mortality in the world. In contrast to many other malignancies, the incidence and mortality trends have continued to increase over the last decade despite the identification of numerous tumor-related biomarkers. The key to survival in patients with melanoma is early and accurate diagnosis and staging so that appropriate treatments can be initiated. Our current studies utilize our novel peptides for non-invasive diagnostic and prognostic imaging, as well as for potential targeted therapy. 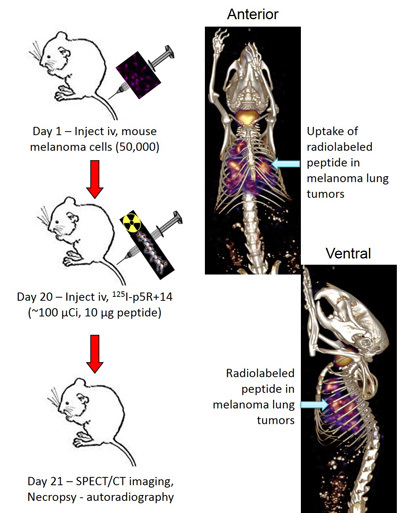 We have used 125I-p5R+14 peptide for the detection of “metastatic melanoma” in the lungs of mice by using SPECT/CT imaging. Tumors were generated by intravenous injection of tumor cells. 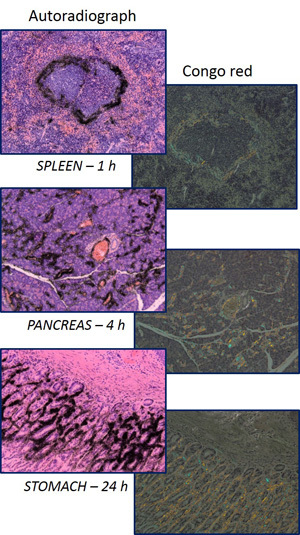 After 21 days, the tumors have developed into 2 - 4 mm-sized colonies and can be readily visualized by SPECT imaging in the mice using the radioactive peptide. This specific targeting ability allows not only detection of the tumors but may also provide a means of delivering a therapeutic “payload” to eradicate the small metastases.